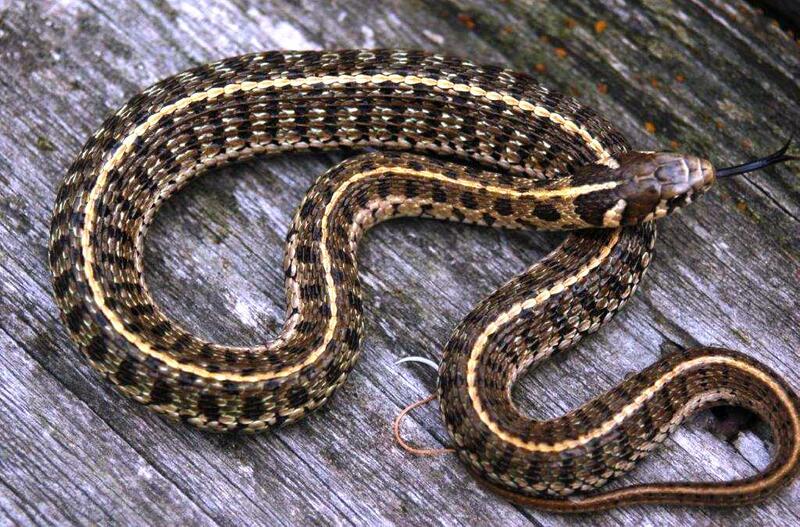 The ecology and biology of many species of garter snakes originating from Mexico has not been well researched. 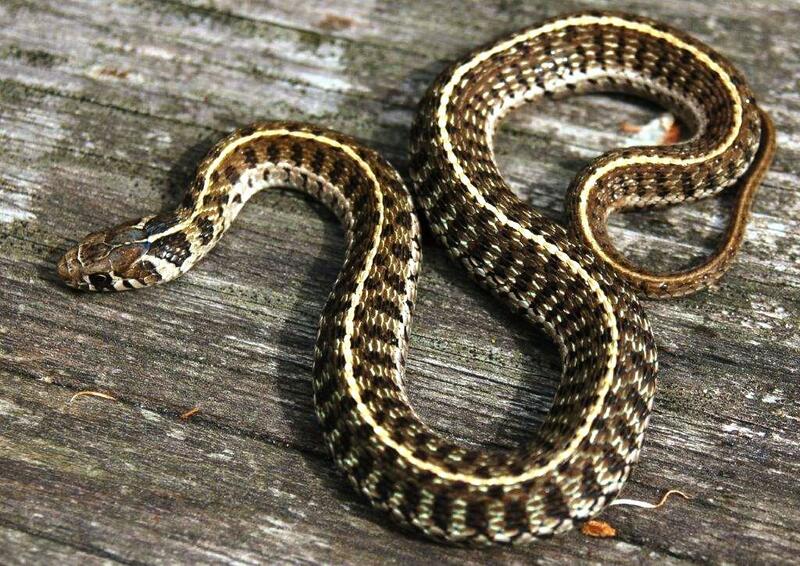 This certainly applies for the Short-tail Alpine Garter Snake Thamnophis scaliger. 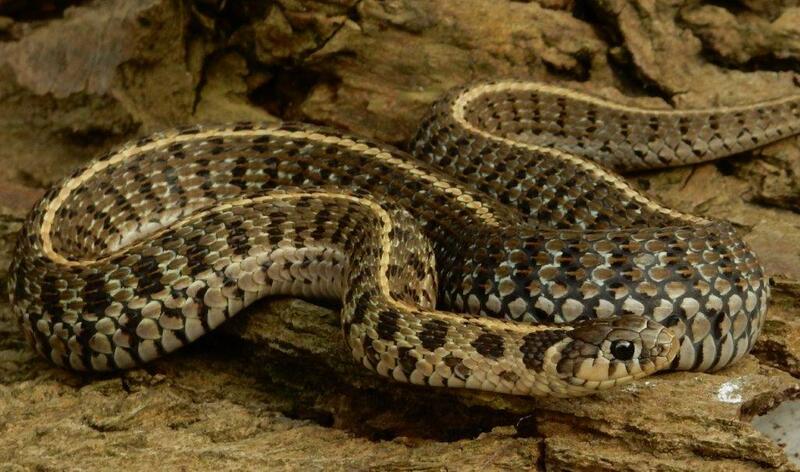 This short species of garter snake is also known (Rossman, Ford & Siegel, 1996) under the English name “Mesa Central Blotched Garter Snake”, referring to its blotched pattern and the general area where it occurs in Mexico: the “Mesa Central”. 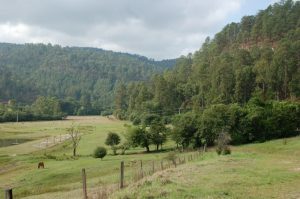 The Mesa Central refers to southern part of the “Mexican Plateau” that occupies a large part of central Mexico and that has an average elevation of 2000 meters. I have kept and bred this relatively secretive species for a few years. 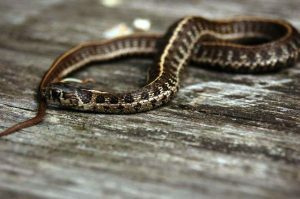 This gave me the unique opportunity to learn more about the (reproductive) biology and the ecology of this fascinating little species of garter snake. 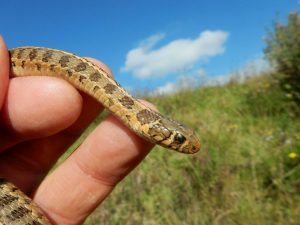 In this article I want to share my observations on Thamnophis scaliger both in the wild and in captivity. Rossman, Ford & Siegel (1996) describe this species as a short species with a maximum total length (TL) of 567 mm. All my adults are smaller than this. My adult females vary from 448 – 512 mm TL, my adults males are 412 – 473 mm TL. 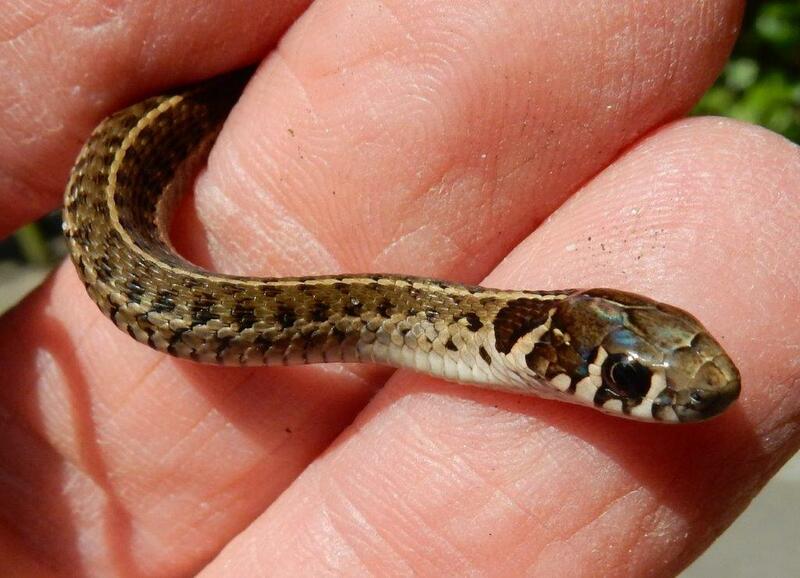 Not many species of garter snakes are this small as adults. 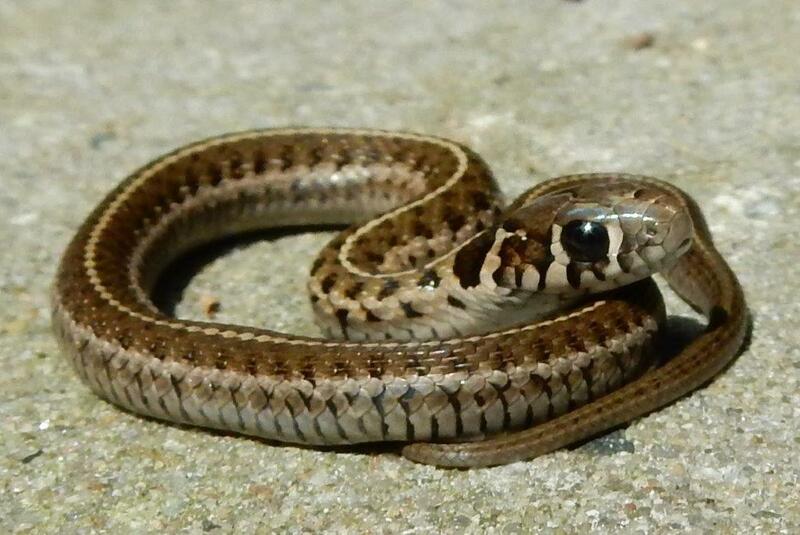 The only two species that are smaller are the elusive Thamnophis excul, and maybe Thamnophis brachystoma. 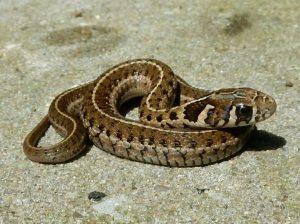 Although maximum total length of the latter species (559 mm in Rossman, Ford & Siegel , 1996) is very similar to Thamnophis scaliger. 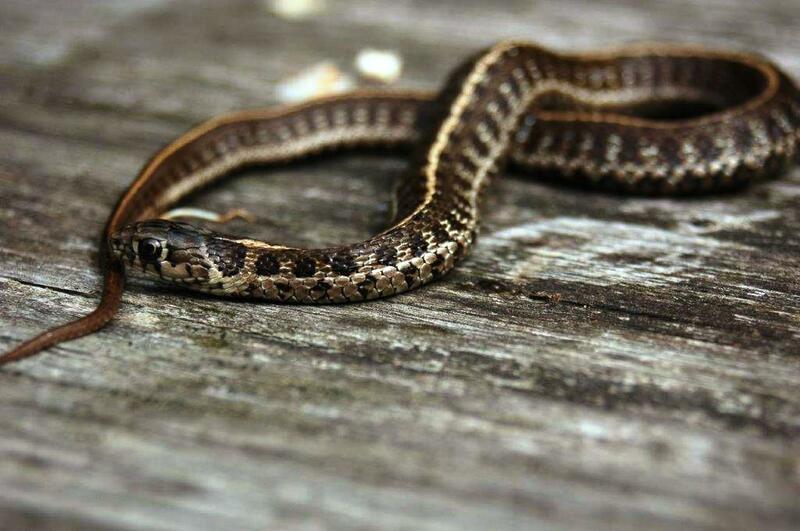 Despite being small, especially the females are relatively stout bodied compared to other species of garter snakes. 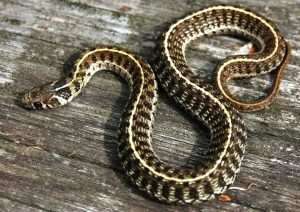 When I first found this species in the wild I thought I was looking at a checkered garter snake (Thamnophis marcianus). 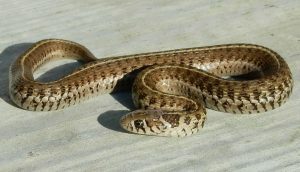 A pale light brown species of garter snake, with inconspicuous dorsal stripes and with 2 alternating rows of (small) black dots. T. scaliger and T. scalaris have long been seen as sister species or even considered as one species mainly based on a very similar pattern of large blotches between the 3 stripes. Keeping both species in captivity clearly demonstrates that these species are very different in many aspects as was the conclusion of Rossman and Lara-Gongora (1991). Rossman, Ford & Siegel, 1996 describe the pattern of T. scaliger as “brown with a series of short (up to 2 scales long), black-edged, dark-brown blotches anteriorly; sometimes these blotches are broken up to form two rows of alternating black-edged, dark-brown spots”. Only one of my males, originating from the state of Mexico, has those typical large blotches between the stripes anteriorly. All my specimens from Michoacán have the 2 rows of blotches. In some of them the lower row of spots are quite big and in some specimens those blotches are quite small. Ground color varies from light brown, very pale brown to a more greenish brown. The dorsal stripe is usually distinct and quite pale, from yellow to white and only 1 scale wide. 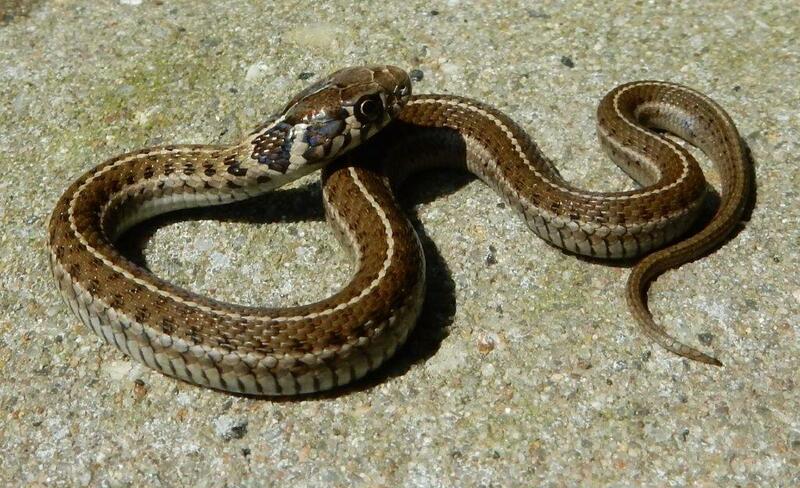 The lateral stripes are paler then the dorsal stripe and less conspicuous. A big difference between T. scalaris (its “sister” species with which T. scaliger often has been confused) and T. scaliger is the length of the tail: in T. scaliger the tail length is very short. The average tail length varies from 15,6 – 17,4% in my adult females T. scaliger, and 16,3 – 18,6 % in my males. In my adult T. scalaris the average tail length varies from 18,7 – 19,8% (adult & subadult females) and 23,9 – 28,9 % (adult & subadult males). 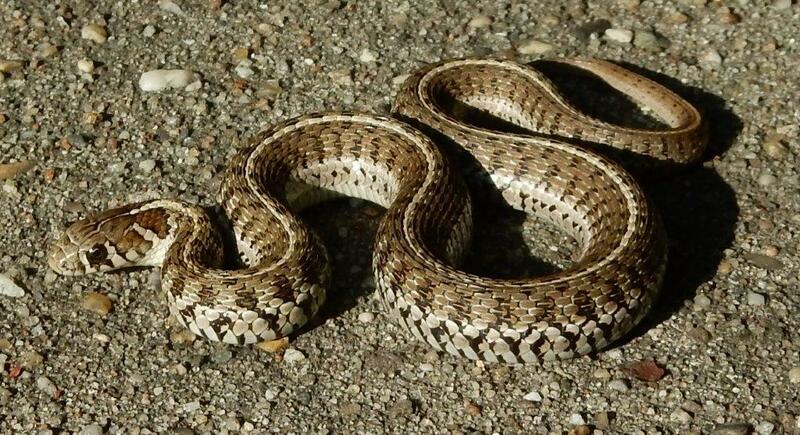 A second difference between T. scaliger and T. scalaris can be found in the pattern / coloration of the supralabials. 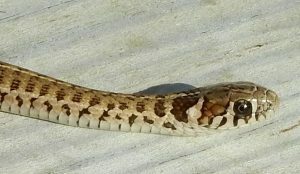 In T. scalaris all supralabials are light in color, whereas in T. scaliger the last 1 – 1,5 supralabial scales near the corner of the mouth are dark brown like the adjacent temporal scales. A third difference that is mentioned Rossman, Ford & Siegel (1996) is the light chin in T. scalaris that would be in contrast with the color of the ventral scales. In T. scaliger this contrast is absent. I have to say that that I find this 3rd difference not very obvious, but the first 2 differences are usually enough to tell the 2 species apart. The map in Rossman, Ford & Siegel (1996) shows the known distribution in Mexico. This is one of the many endemic species of garter snakes in Mexico, meaning that they do not occur outside of Mexico. 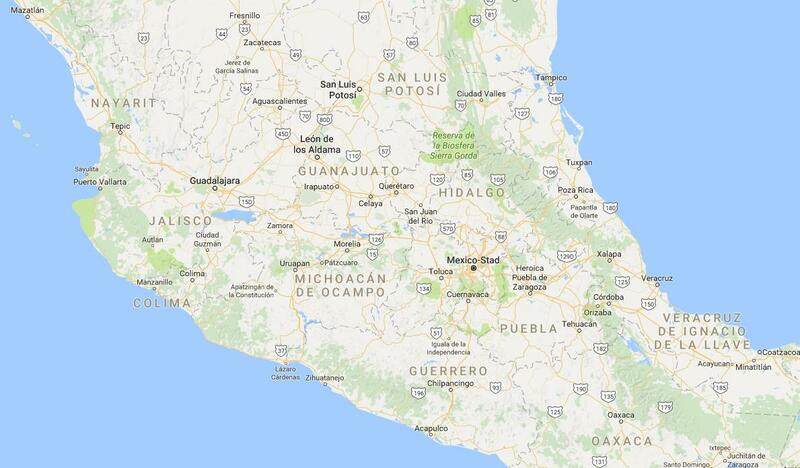 T. scaliger is only known to occur in a limited area in Mexico, in the following states: Guanajuato, Jalisco, Michoacán, Mexico and Morelia; at elevations between 2288 to 2575 meters. Its habitat is described as semi-arid desert-scrub valleys and oak forests at the lower portions of high mountain ranges. 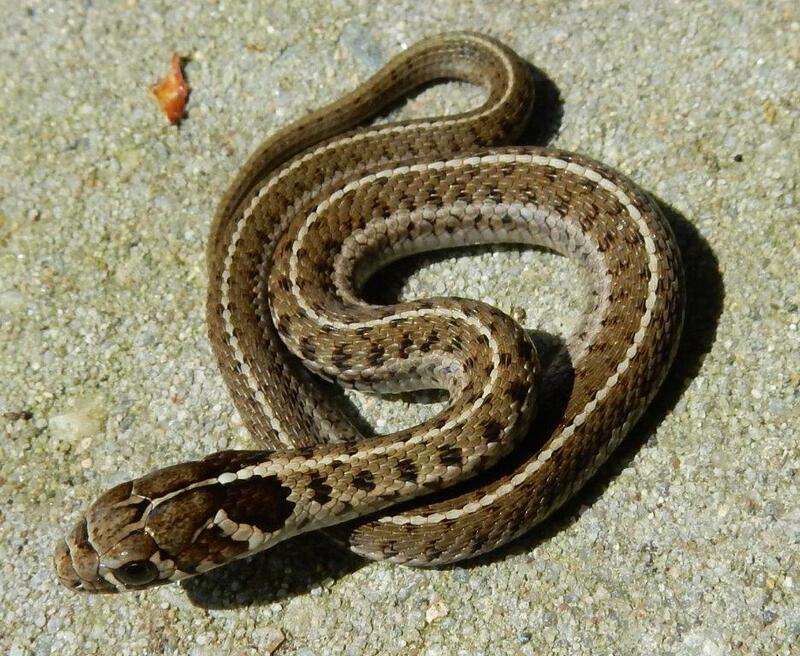 Because of its secretive nature and because not many herpetologists are actively exploring central Mexico I expect that this species will occur over a wider territory then the map in Rossman, Ford & Siegel (1996) suggests. The fact that I have found them in an area (see next chapter) not mentioned in Rossman et all. (1996) is already a good example. 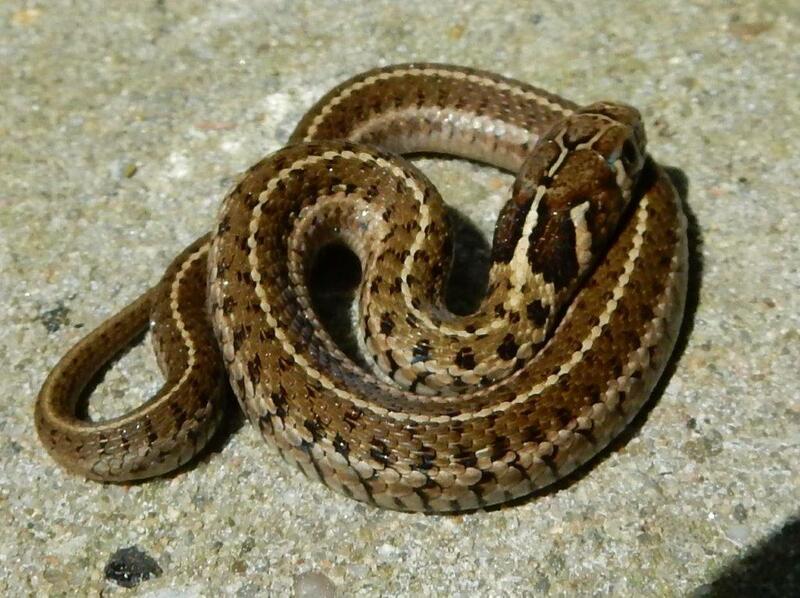 I have observed this fascinating little garter snake on a few occasions during my travels through Mexico. In North-Eastern Michoacán, not too far from the city “Ciudad Hidalgo” I have observed them in a little park. 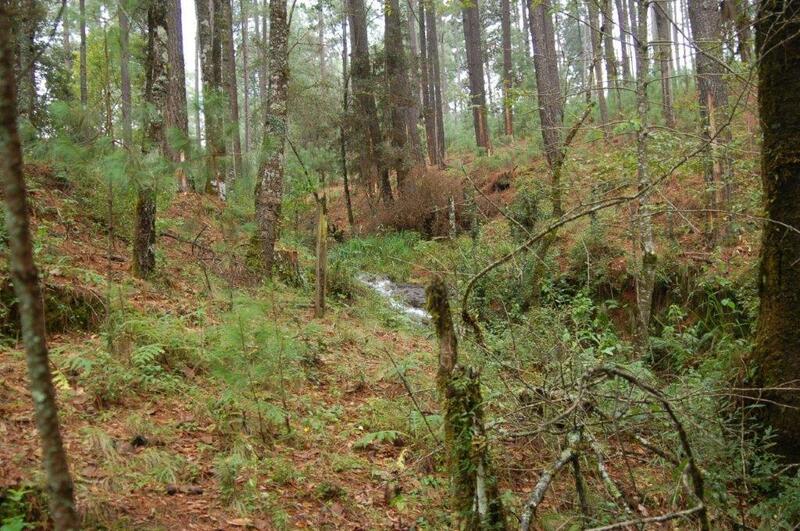 A fast flowing river had carved out a valley (valley 1) between mountain slopes covered in pine forest. 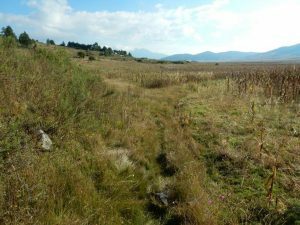 The valley itself was mostly open grassland where horses and cows kept the grass short. It was May 25th and I had been searching garter snakes all day without much luck. The little park was my last attempt for the day and it did not look very promising. Behind some fences where the horses could not keep the grass short there were some logs and rocks, which I turned. 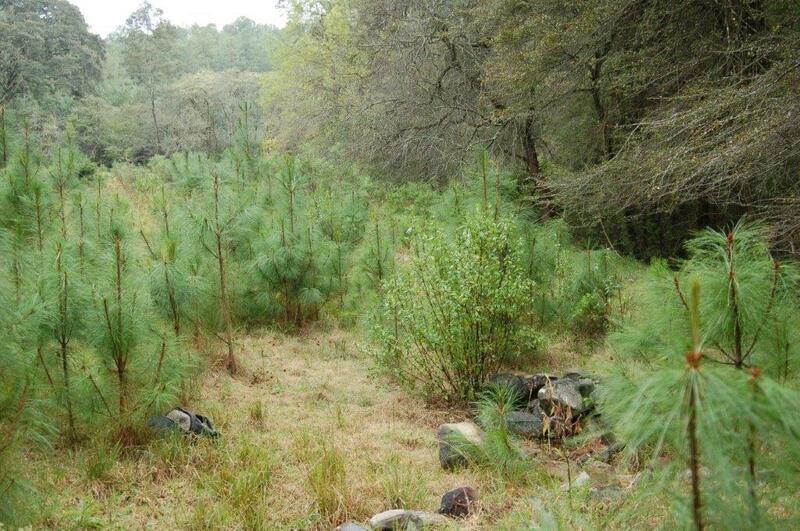 It was an east facing slope with pine trees spread out giving the sun ample opportunity to reach the soil. Under one of the last rocks (a fairly big one) I turned I found 2 small garter snakes coiled up totally unexpected. I was not specifically looking for T. scaliger and according to the map in Rossman, Siegel and Ford (1996) they should not occur there. 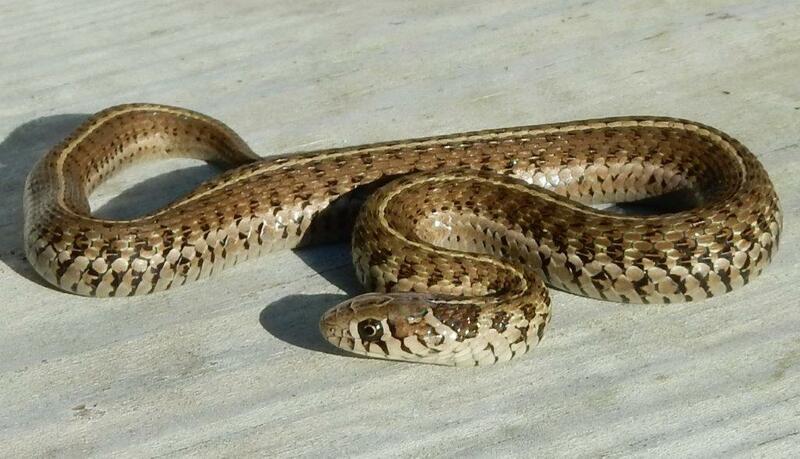 The snakes were obviously garter snakes but they looked at first glance very much like T. marcianus. It was 5.20 PM, it had been quite sunny all day but clouds were rolling in and it look like a thunderstorm was underway. The temperatures was still about 25 °C above the ground and 23 – 24 °C under the rock. The snakes felt relatively warm. 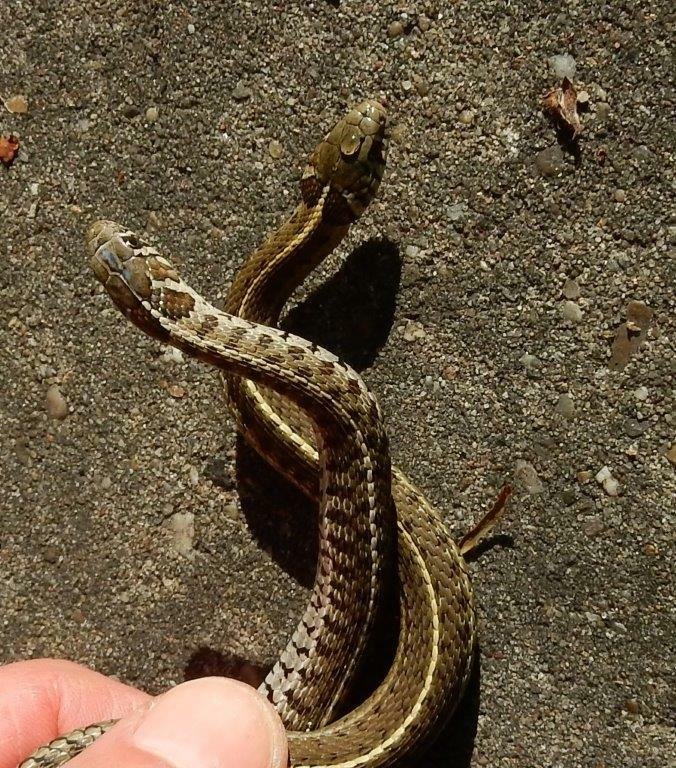 Both snakes were female and pregnant. Total length was 41 cm (33 cm svl and 7 cm tail length) and 37 cm (33 cm svl. and 4 cm tail length, tail was broken). The altitude was appr. 2160 meters above sea-level. The following morning I decided to search intensively to see if I could find more T. scaliger. The sun was above the mountains at 08.40 AM. Air temperatures were 10 – 11 °C, ground temperatures 15 – 16°C . 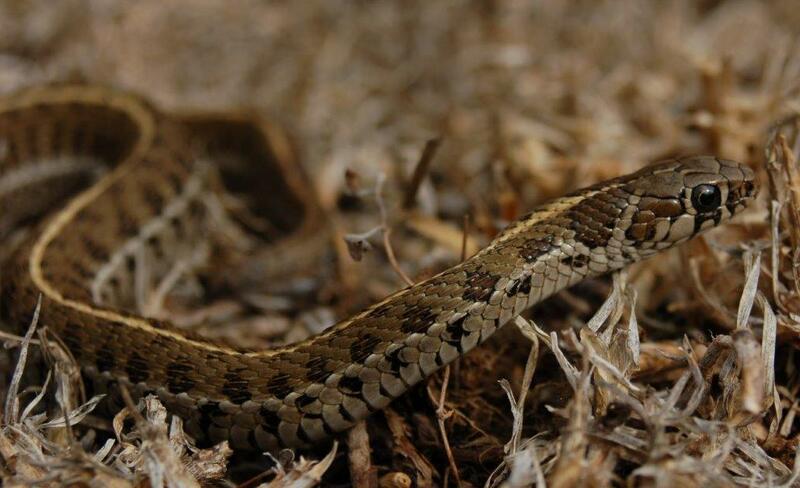 I started looking for snakes at 9.30 AM when temperatures had risen to 17 – 18 °C. It was a mix of sun and clouds and circumstances were looking very good. I searched for 3 hours but I found none. I had expected to find many of them, all basking out in the open. At the end of the day I decided to check another little valley (valley 2), about 3 km away from the previous one. 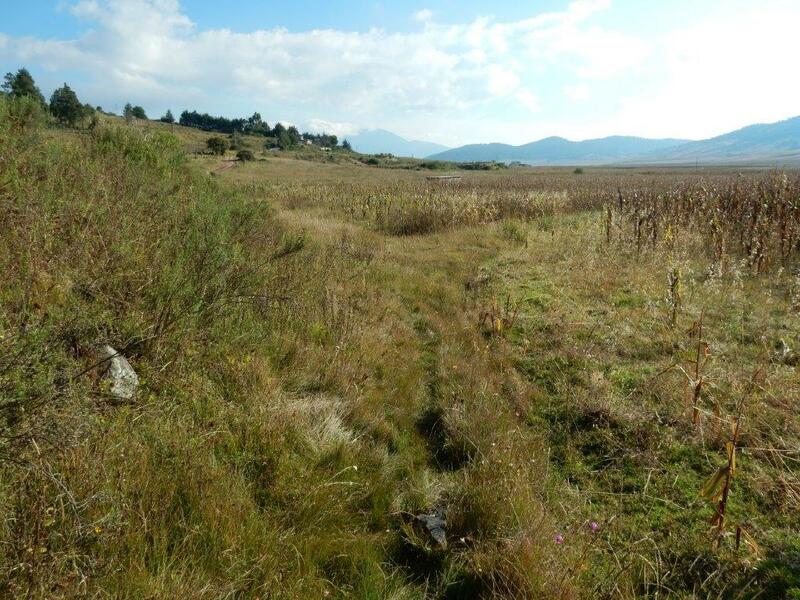 There was an open strip of grassland bordering a very small and little creek in a pine forest at 2510 meter. There was a little pile of rocks in the open grass. This pile of rock was about 150 cm above the water level in the little creek, and hence the soil was not very wet; I would say loose and dry. So I decided to search in this little pile of rocks. 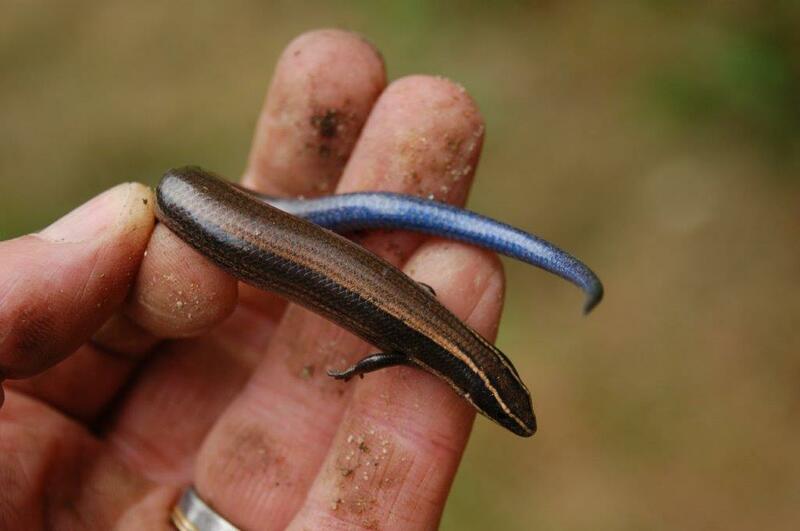 Around 3 PM I found in the pile of rocks a Sceloporus sp., a skink with a blue tail and a third female T. scaliger. She was lying coiled up against the rock were the temperature was about 29 °C. Like the previous 2 females also this one was pregnant. Her total length was 37,7 cm (31,5 cm svl + 6,2 cm tail length). Air temperature was 19 °C, and the rocks were about 34 °C on top. Like the previous day the sun had been shining most of the day but now clouds were rolling in and it started to rain at 4 PM. In the creek I found some larvae of a salamander; likely Ambystoma ordinarium, the Michoacán Creek Salamander. They could very well be a potential food source for the T. scaliger. 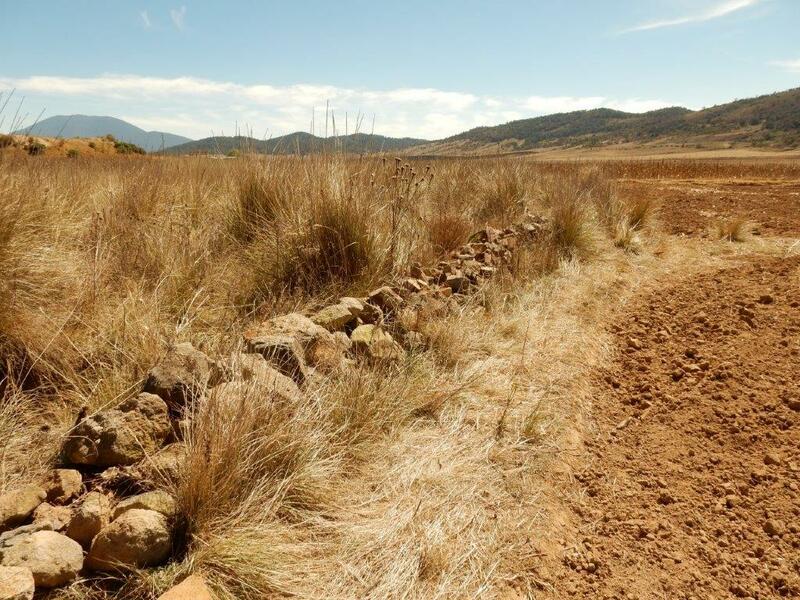 The narrow strip of open land (where no cattle was grazing) likely allows the sun to warm up the pile of rocks from early morning until midafternoon. At 3 PM the pile of rock would be in the shade for some considerable time. November 23rd I visited the first valley (valley 1) again. It was at the end of the day. It was dark and cool day. It even started raining. I searched from 2.30 – 4 PM. No snakes were found, but I did find an adult toad that looked like a Spade food toad not too far from where I found the 2 pregnant females back in May. Rossman, Ford & Siegel (1996) mention that both field observations and data from captive specimens show that T. scaliger feeds on larvae of Spade foot toads, Spea hammondii. Although this specific species of Spade foot toad does not occur in Michoacán, so the field observations must be based on another species of this genus. November 24th I visited (valley 2) again. It had been a warm and sunny day, and the strong and intense sun can heat up the soil rapidly when shining. I searched from 3 – 4 PM approximately. The same pile of rocks was checked again. I found a juvenile Sceloporus sp., 4 skinks with blue tails and 2 T. scaliger. All hiding under or between the rocks. The 2 T. scaliger where beneath large and relatively heavy rocks. The first one I found at 3.35 PM: a male of 26,1 cm TL (21,5 cm SVL and 4,6 cm tail length). Because the pile of rocks was already in the shade for some time the little male had a body temperature of approximately 12,5 °C. The second one (3.40 PM) was also a male; TL was 29 cm (23,5 cm svl plus 5,5 cm tail length). I also found some amphibians in the same valley where the soil was very wet (due to the summer rains I expect). I found a juvenile tree frog (Hyla extremita). I also observed a large Bell’s False Brook Salamander (Isthmura bellii). This is a very distinctive black salamander with vivid red coloration. 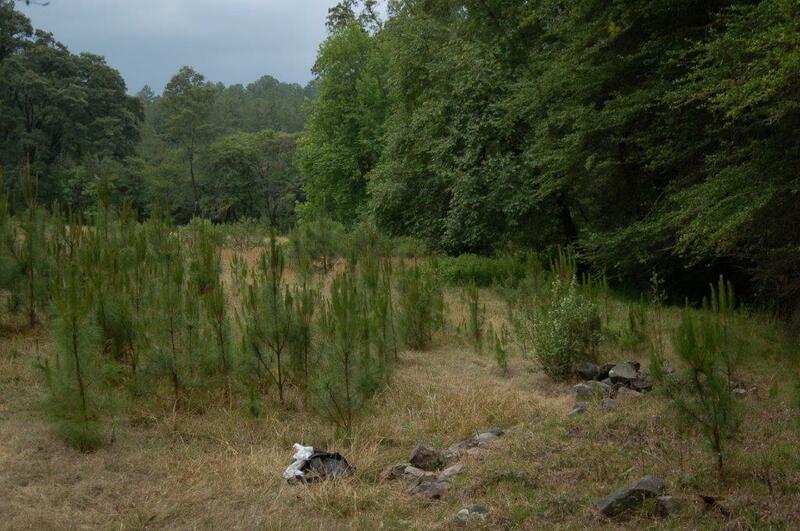 On the 20th of November I searched in another habitat from 3 – 5 PM, not too far from Atlacomulco, Mexico. The day started cold at 11°C but the sun was strong. Where the sun can heat up the surface it gets 30 – 40 °C easily. This habitat is huge open valley surrounded by some mountain slopes that are covered in trees. A small creek runs through the valley and ends in a huge lagune. The farmers in the valley are mostly cultivating corn, and for their cattle and crops they created ponds all over the valley. 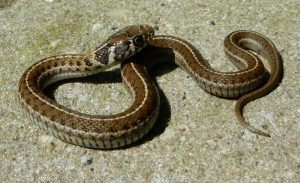 Under a rock that was lying in the grass on the “dyke” of a small pond I found a beautiful male Short-tail Alpine Garter Snake. The male felt warm and he was well fed. I suspect he was still actively feeding. His total length was 40,4 cm (33 cm svl. + 7,4 cm tail length). The pattern of this specimen was much different compared to the ones from Michoacán: he had the big blotches between the stripes very similar to the pattern of T. scalaris. This specimen also had a very attractive coloration. His dark blotches were quite light (a sort of greenish brown). He had a lot of yellow in his pattern and his base coloration was greenish. 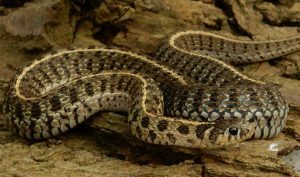 On previous trips I have found T. scalaris in the same valley, and they are known to occur sympatrically. Beside the T. scaliger I observed a basking juvenile rattle snake (Crotalus sp., he was too fast for identification) and some Sceloporus sp. At 5 PM the sun was already dropping rapidly and it started to cool down. A juvenile Salvadora bairdi (35,7 cm TL) with a recent prey in its stomach was enjoying the last rays sunlight. 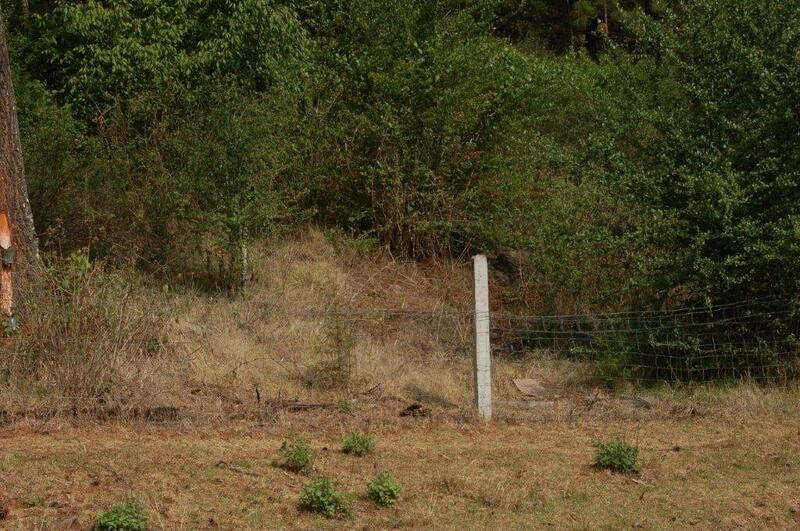 The same habitat near Atlacomulco was also visited March 26th. Upon arrival early in the morning the ground was white from the night frost. Hardly anything is growing in this season. The corn fields are empty and plowed using a horse and a plow. The grass is dead and yellow. But the sun is always intense and it is very dry… It is the dry season. 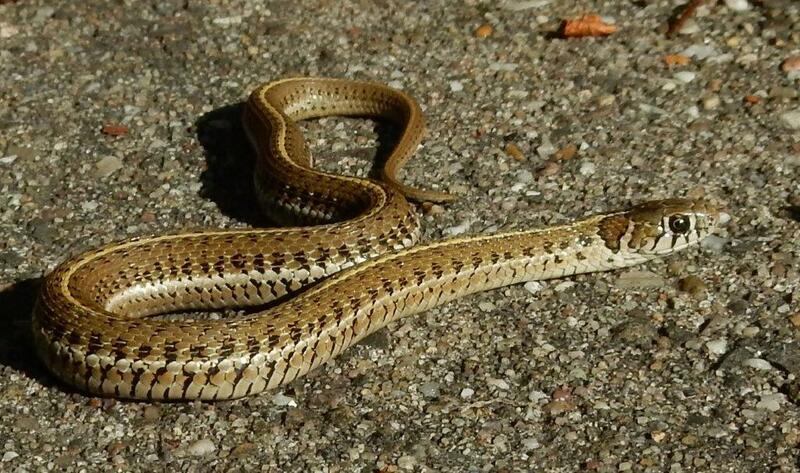 Soil temperatures rise very easily and rapidly to 30 °C and higher… A Short-tail Aline garter Snake was found dead. Chopped up in 3 – 4 pieces, without a doubt by a farmer with a big machete. It was probably killed the same day, while basking or crawling around. It was discovered near a little wall of rocks between the cornfields. This snake was darker, more greenish with a double row of spots (resembling the Michoacán specimens). Based on the diameter of the body I would say it was a female. I have kept this species in several different terraria, always in little or bigger groups. Currently I have a breeding group of 2.3 in a terrarium of 59 x 40 x 40 cm (59 cm being the length). Since the snakes are pretty small this size is sufficient, although a bigger set up of 100 x 50 x 50 cm gives more possibilities as far as different temperatures and moisture ranges are concerned. The terrarium is full glass with ample ventilation on top. A reflector bulb is hanging on one site of the terrarium in such a way that a temperature gradient is created, from 30 – 35 °C under the lamp to 15 – 25 °C in the cooler corner. The bulb is burning approximately 12 hours a day and at night the terrarium temperature drops to ambient temperature in my snake room. Ambient night temperature can be up to 22 – 25 °C in the summer, and 12 – 18 °C in winter/ fall/ early spring. During the winter I keep them even a bit more extreme, but I will describe that under hibernation. I have experimented with the substrate and I have concluded using cocopeat and wood chips works very good for this species. I try to keep the warmest area in the terrarium dry with woodchips mixed with a bit of cocopeat and in the cool area I use a thicker layer of cocopeat that I keep slightly moist. I have kept them during a few summer months in a completely dry and hot set up that was also heated from the bottom. The snakes did not do well and had problems shedding their skins. Since the snakes like to hide I use rocks, pieces of bark and peat moss so the snakes have ample opportunity to hide. I also have a piece of bark just below the bulb so the snakes can bask both in the open but also underneath the bark and reach their preferred body temperature of approximately 28 – 32 °C. I also use some branches to give the snakes some opportunity to climb. I have not seen them (in my terrariums, which are pretty low) climb a lot, they tend to stay on the ground. A relatively small water bowl of 12 cm diameter completes the set up. They do not spend much time, if any, in the water. 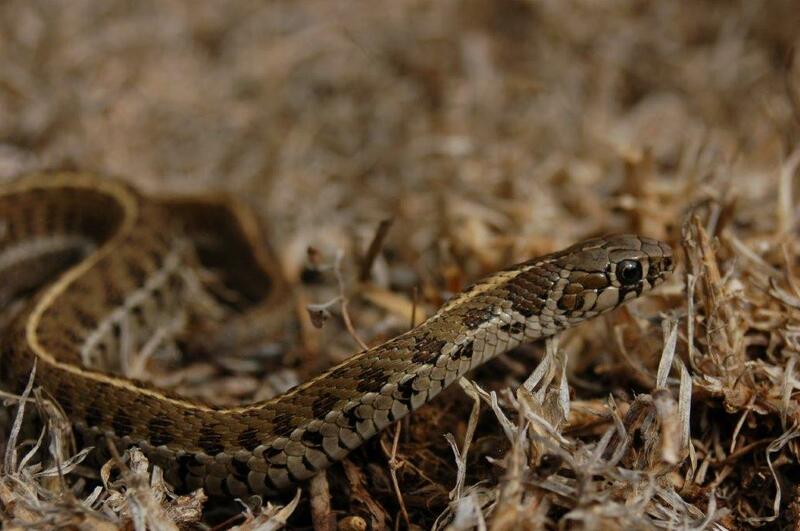 One of the challenges I have faced with keeping some of the smaller and more terrestrial Mexican species of garter snake that live in high altitudes in the Mexican volcanic belt (like T. scaliger) has been how to simulate the circumstances they experience in the wild. I prefer to stay relatively close to the natural situation and this means for most American and Canadian species that a true hibernation is inevitable. But what about these Mexican highland species? Like T. scaliger? Do they hibernate for long periods at a time? The rainy season ends somewhere in September and then it gets dryer and colder towards the winter months. Night temperatures drop to 2 – 5 °C regularly, and during cold fronts temperatures can even drop below 0 °C. But most days are sunny in the winter and air temperatures rise to 18 – 24 °C, but due to the intense sun substrate and rocks easily reach the 30 – 40 °C. Only on cloudy or rainy days temperatures may stay in the 8 – 12 °C. So in theory T. scaliger could stay (somewhat) active on most days, or at least they could be able to heat up to their preferred body temperatures. But there is not much research done in that respect. In literature (Manjarrez, J., C.S. Venegas-Barrera & T. Garcia-Guadarrama, 2007) I could find a report on the ecology of its “sister-species” T. scalaris in Toluca. They did research on a population that lives at an elevation of 2550 meters in Toluca. 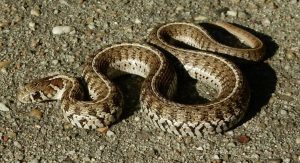 They could find T. scalaris more or less throughout the year, the latest date in the year being December 15th, the earliest January 28th. In February they found none. They looked for the snakes by turning rocks and other types of shelter. The article concluded that there is less activity in the winter. The snakes are inactive and inconspicuous for days or weeks and only inactive snakes coiled under rocks were collected. 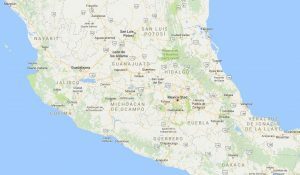 My personal expectation (based on the above mentioned literature and my regular trips to Mexico) is that T. scaliger is somewhat active throughout the year, except the cold and cloudy periods in the winter that may last 1 or 2 days or even 1 – 2 weeks. Even though Manjarrez, J., C.S. Venegas-Barrera & T. Garcia-Guadarrama (2007) compared the observations of T. scalaris with seasonal rainfall and temperature and they concluded that there is no correlation. I n order to simulate the cold nights in winter I build some terraria in my unheated shed to keep T. scaliger for a period of 6 – 8 weeks in the winter. They are made of plywood with a front of glass, 40 cm wide, 40 cm height and 60 cm deep. The bulb is hanging in the front, and the ventilation is made in the back creating a strong temperature difference. The front near the lamp has woodchips as substrate and some rocks, the substrate in the backs is 10 cm thick layer of slightly moist cocopeat. At night the temperature drops to ambient in my shed, which is anywhere between the 1 – 10 °C. In the morning when the bulb switches on the front heats up to 20 – 25 °C, but the cocopeat only heats up very slowly, also because the large area of air exchange in the back. So the cocopeat heats up to 14 – 16 °C maximum, likely less. 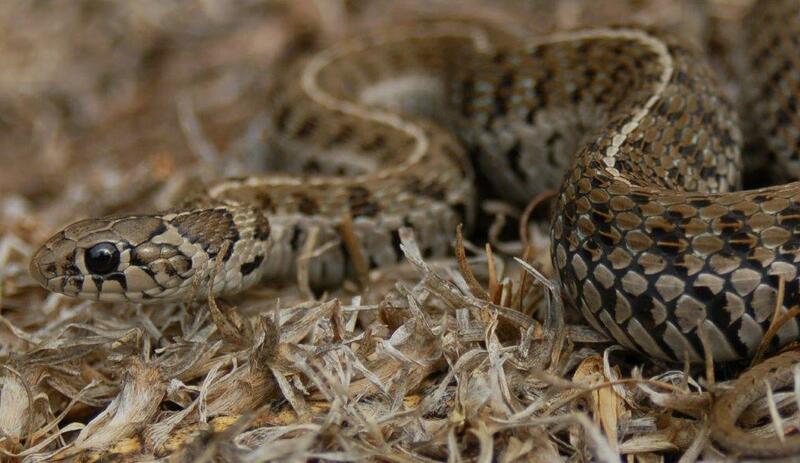 This way the snakes can choose between remaining inactive and cold, or actively basking during daytime. They cannot choose the night temperature, that is always cold. The method described above is not obligatory for keeping and breeding T. scaliger successfully. In 2016 I did some tests where I followed 3 strategies: one group (1.2) was kept warm in my snake room, 1.3 was kept in my unheated shed for 7 weeks and 1.1 for 15 weeks. All 3 groups did fine and females produced babies in all 3 groups. Behavior in captivity and yearly cycle. In the chapter on life history and ecology in Rossman, Ford & Siegel (1996) I read that T. scaliger shows a seasonal activity period, being most active in the hottest and wettest season of the year. Coming out after the first spring rains. But this is a quit secretive species, so observations in the wild are relatively difficult. Keeping this species in captivity can possibly reveal extra information on behavior throughout the year. 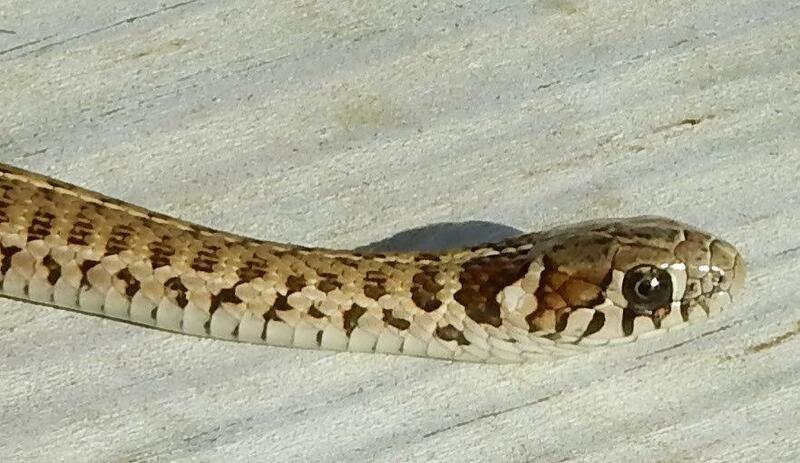 If we start late in the fall / early winter (November) the snakes are getting less hungry and less active. The females are already pregnant late in November. In the winter months the activity is low. When the snakes are in the cold shed they do not eat, but also the ones kept warm in my snake room refuse most food in January and February. In the cold shed the snakes bask every now and then, the pregnant females clearly more than males and females that are not pregnant. As an example my observations on January 28th 2017: I checked activity of 1.3 in my cold shed. The night temperature had been about 3 °C and within 1 hour after the bulb switched on the female that was most clearly pregnant started basking and continued all day until the lights went out. The other 2 females (1 pregnant, the other not) and the male did not show themselves all day. During the week I saw the same female every day, the male once and the other 2 females not all. At the end of that week the outside temperatures rose to 10 °C and then I saw 1 of the other 2 females. The 3rd females has already been hiding for 3 weeks. Late February and early March I checked almost every day of the week. Temperatures varied from 6 – 10 °C but on none of the days I could observe any behavior or activity. So each of the different specimens of 1.3 group in my shed in January/February behaved different. One female that was not pregnant has been hiding for 7 weeks on a cool and dry spot, almost as a complete hibernation. 1 pregnant female has shown herself a few times, but was hiding for 90 % of the time: also almost a complete hibernation. The female with the most far developed embryos was fairly active and basking appr. 30 % of the days. The male just a little less than the highly pregnant female, maybe basking 20% of the days. 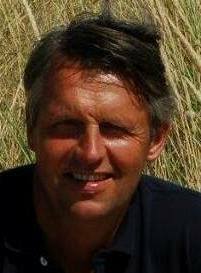 When temperatures outside start to rise in March and also my snake room temperatures (by mid-March the T. scaliger are all inside, not in my shed anymore) start to rise the snakes become more active and bask more and more, either hidden or in the open. The snakes do eat, but not a lot and not very regularly. They regularly skip food. And when they eat they eat tiny bits. So March and April are a bit of a mystery. Every time I expect the appetite to increase, but often the food is untouched the following morning. Then in May and June the babies are born, and starting June they become clearly more hungry and more active. Then starts a period where they eat a lot and ferociously: July, August, September and October. With every feeding the snakes finish the plates in no time, and I have to make sure I provide enough food. Mid-September the first mating behavior has been observed. A coitus was observed October 30th and November 15th (the latter in my cold shed). Then by November / December activity and appetite start to slow down again. The reproductive biology of this fascinating little species is very different from the “northern” Thamnophis species from the US and Canada. I have observed mating behavior in the terrarium from mid-September onwards. This continues in October and until mid-November. A real copulation has been observed on October 30th 2016 and on November 15th 2015. In 2017 I saw mating behavior January 28th. This was 2 weeks after they moved from the “hibernation terrarium” in my shed to the warmer snake room. Until now this was the only time I saw mating behavior after November. The first signs that the females are pregnant become visible towards end of November. By mid-December it is very obvious, and the developing embryos can be counted via gentle palpation. 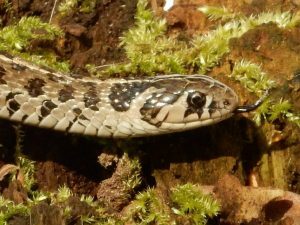 The snakes are sometimes visible basking in the open, or basking under a piece of bark. The snakes hardly eat. In the winter of 2015/2016 I kept a group inside (“warm”) throughout the winter. Even though both females were pregnant they were “hiding” on the coolest spot in the terrarium during a check on January 3rd. So the winter proceeds, and both inside as outside they behave quite similar. Activity remains very limited and appetite close to zero. During January and February not much changes. Between February and March most snakes shed their skins. In March outside temperatures start to rise and the basking becomes more pronounced. It is clear that the pregnant females are spending more time basking then the males and the females that are not pregnant. The terrarium in which they are kept has a wide temperatures range. So during daytime the snakes can heat up to approximately 28 – 30 °C, but if they remain at the coolest spot the maximum temperature during daytime does not rise much above the 20°C. And at night it drops to ambient, which is in February and March in my snake room anywhere between the 12 and 18°C. Also in April it does not really change. All the time I offer food weekly and sometimes they accept a little bit. But very limited. Finally May 5th 2016 I found babies, likely of the 2 females that were kept inside throughout the winter. One of the females that was kept outside for 7 weeks gave birth June 14th 2016, so 6 weeks later. The female that was kept outside for 15 weeks gave birth somewhere end of June, so 8 weeks later. Gestation period is hence extremely long: approximately 6 – 7 months. The pattern that is emerging is mating late in fall or early in the winter. The females are pregnant already in December and during the winter months the babies develop inside the mother. But the females do not give birth until the driest and hottest time of the year (March- May) is over. The pregnant females I observed in the wild in May will likely have given birth a little later then my captive specimens, possibly end of June or end of July. The time the rainy seasons starts or has started and food supply is increasing. 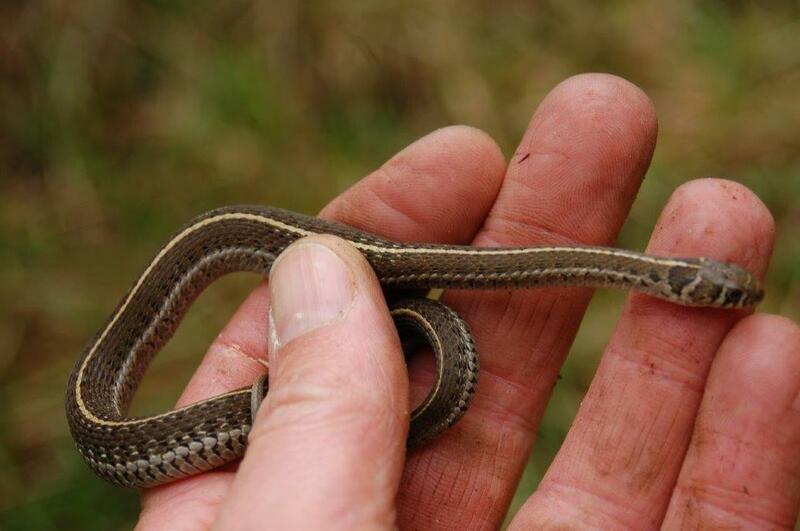 For most Northern species of Thamnophis gestation period is influenced by temperature. The warmer you keep them the shorter it lasts. They mate after hibernation and approximately 3 – 4 months after mating the babies are born. So the gestation period of T. scaliger is almost twice as long. Of course this can be partly explained by their stay in my cold shed, but it almost looks like they can slow down the development of the babies. 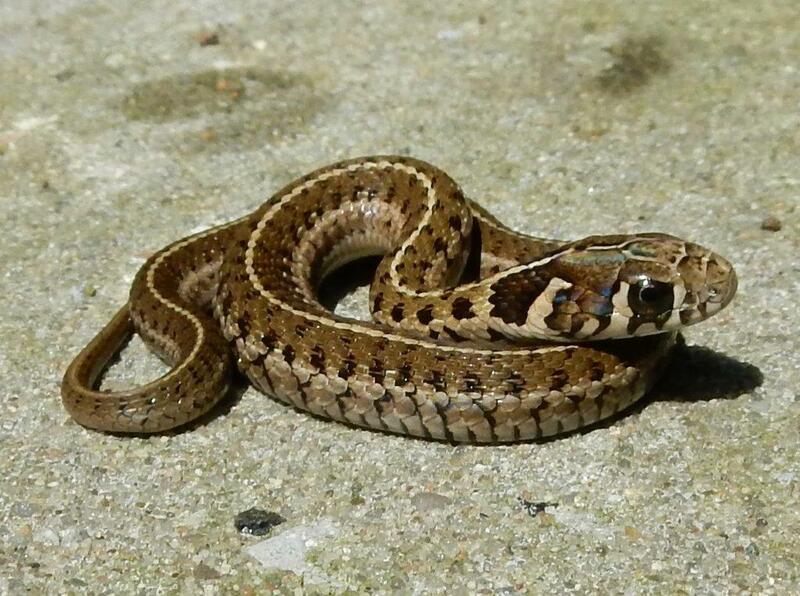 Maybe the pregnant T. scaliger maintain a much lower average body temperature compared with the Northern Thamnophis species in order to postpone parturition and time it with birth in the rainy season? It would be very interesting to use modern techniques and follow the body temperatures of a group of female T. scaliger throughout the year and compare this with Northern species. The total length of the newborn babies varied from 13,9 -18,2 cm. 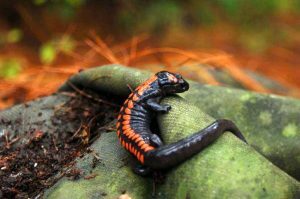 Average size of 4 litters or litter combinations (in 2 instances 2 or 3 females had babies at the same time within the same vivarium so they could not be distinguished) was 14,7 cm, 14,8 cm, 15,8 cm and 17,3 cm (total length). Average snout vent length varied from 12,0 cm – 14,1 cm. Since I have kept them in a group and females gave birth simultaneously I am not 100 % sure about individual litter size. In one year I am sure only 3 females gave birth; one female gave birth to 3 babies, the other 2 gave birth to 7 babies in total. In 2016 only 2 of my females gave birth individually: 5 and 6 babies. 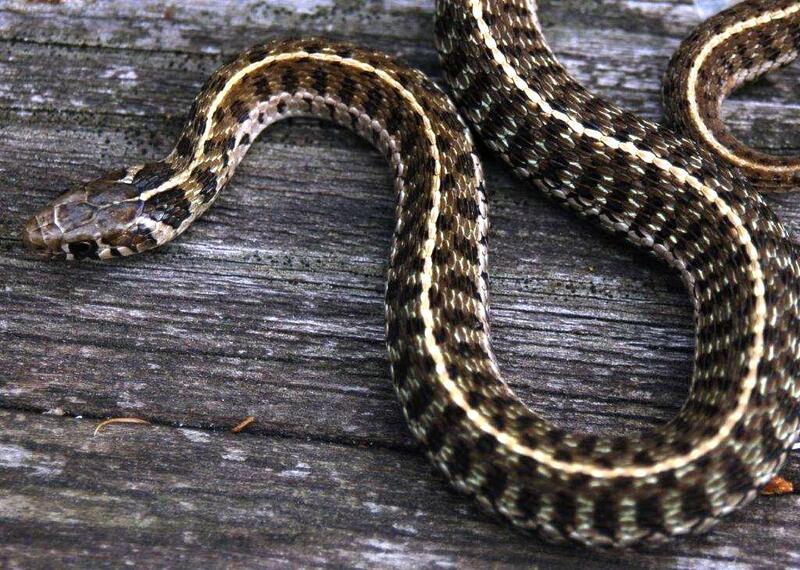 So litter size varies from 3 to 6 babies, which is a very low number for a garter snake. 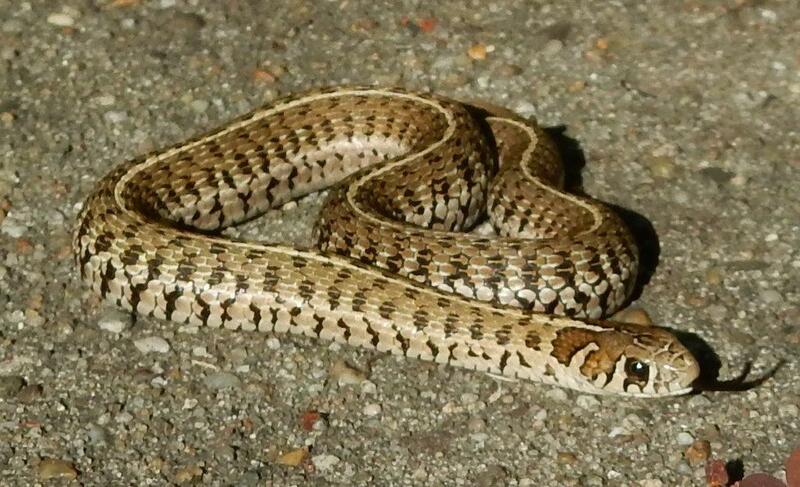 Comparing this data with the data on Thamnophis brachystoma (Rossman, Ford & Siegel, 1996) seems to suggest that T. scaliger has smaller average litter size (4,2 versus 7,6 or 8,8) but with bigger babies (12,8 cm svl versus 10,0 cm). As soon as the babies were born they were separated from their parents and transferred to small plastic terrariums of approximately 30 x 20 x 15 cm with only bottom heat in one corner. I raise them in groups of 5 or 10. The babies are offered food once or twice a week throughout the year. They are offered worms, pinkies and smelt; all cut up in small pieces and offered on a small dish. I try to offer more than they can eat, so each snake can eat as much as they want. Since I feed them in their vivarium together it (giving them more than they can eat) also prevents that 1 – 2 snakes eat everything before some of the more cautious eaters get a chance. Food is usually offered between 7 and 9 PM, and removed either the following morning or late afternoon, giving the snakes ample time to come out and eat. The adults are offered food once a week usually. The diet is the same: worms, pinkies and defrosted smelt. I only cut up the worms. Smelt and pinkies are offered in one piece. On a dish. With every feeding I add calcium to the worms and pinkies and some droplets of vitamin B1 to the smelt to prevent Thiaminasis. Multivitamins (Nekton Rep) are offered approximately once every 1 – 2 months. For worms I only use Lumbricus terrestris. I avoid feeding Dendrobaena sp. 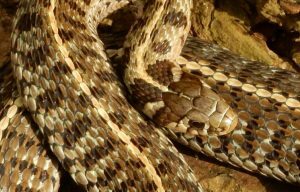 since I do not trust the ones you can buy in most pet shops (as far as nutritional value is concerned) and there is anecdotal information that they can be harmful for the snakes. I have also heard one case where someone lost both his young T. scaliger he got from me after feeding Dendrobaena. But I have to admit I never really tested myself how harmful Dendrobaena’s are… Better safe than sorry. Feriche et. all. 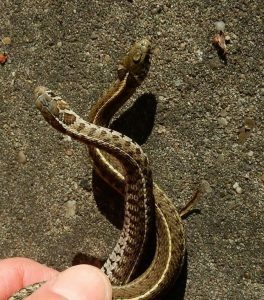 (2011) found no difference in head shape between males and females, in contrast with most other species of Thamnophis. Bigger head size would allow females to handle different or bigger prey. They conclude that both sexes eat the same prey (earthworms) which is in line with the absence of a difference in head shape and size. They make a reference to another article from the same group of researchers: Reguera et. all. (2011) concluded that in their study area near Atlacomulco the diet of T. scaliger consisted of almost exclusively earthworms. 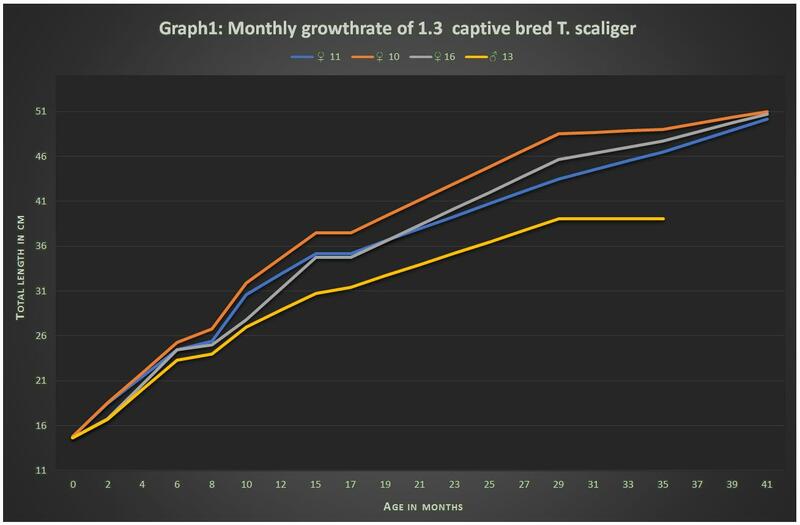 In (graph 1) you can see the growth of 4 captive bred specimens over the course of 35 / 41 months. Since I have not measured the babies every month but at irregular intervals I assumed linear growth between 2 measuring points. This is giving the graph a weird shape. The first 10 – 12 months the growth rates of the 1 male and the 3 females looks fairly similar. But after a year the male stays clearly smaller and growth rate slows down, whereas the females continue to grow (al be it at a slower rate as well). Another aspect that is worth mentioning is that even though 1 of the females (“female 10”) was bigger during most of her second and third year all 3 females were almost equal in total length at an age of 3,5 years, all 3 measuring 50,2 -51,0 cm. In the graphs you see some phases were growth slows down around month 5 – 7, 15 – 17 and (less clearly) 29. This coincides with the winter months. As I said before I have measured at irregular intervals and I assumed linear growth between the 2 measuring point. This created a shape that gives some indications of true monthly growth but I have no doubt the real shape is different. Even though the juveniles, especially in their 1st year, do not really stop eating in the winter growth will slow down in the winter months. 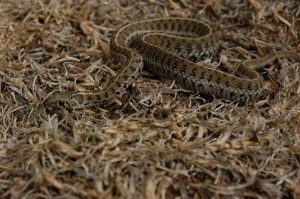 After the winter month growth rate will speed up and it will likely be the highest during June – October when temperatures are highest and when the snakes are very hungry and they are eating a lot. In (graph 2) you can see the annual growth rate. The growth of the same (as in graph 1) 1.3 captive bred specimens (Females 11,10 & 16 and male 13) per year nicely shows the slowing down of the growth after the 1st year. 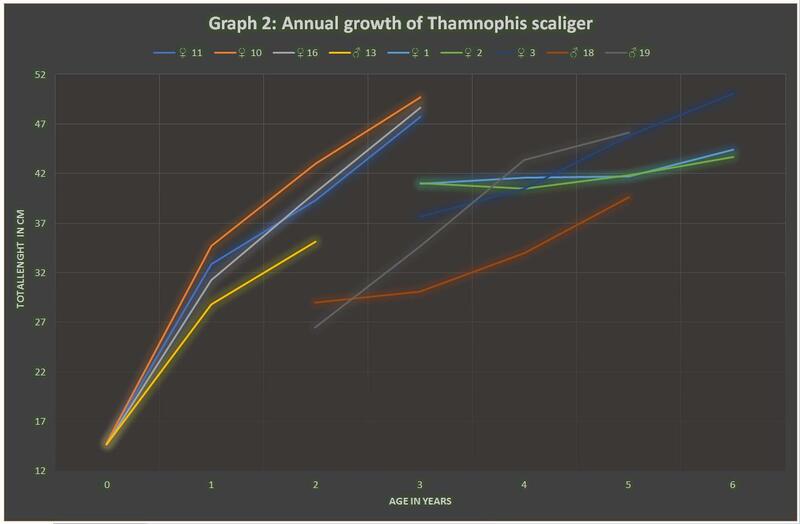 Since I did not know the age of the other 5 specimens that are mentioned in the graph I estimated their age based on how fast the captive bred snakes reached that length and I added one year, assuming growth rate in the wild is much slower. So Female 1,2 and 3 are now at an (estimated minimum) age of 6 years old smaller or equal in size to the captive bred females at an age of 3,5 years. Females 1 & 2 have not grown that much in the past 3 years, whereas female number 3 has grown quite a lot and she has now reached a total length of 50,1 cm at an age of 6 years old. My 2 adult males (nr. 18 & 19) have grown quite a lot and have now reached a total length of 39,6 – 46,2 cm at an estimated minimum age of 5 years old. 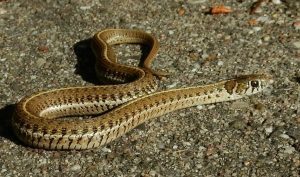 So sexual dimorphism as far as total length is concerned is not so pronounced as in other Thamnophis species, although Feriche et all. (2011) did conclude that females reach a larger average size then males. The difference between males and females is quite obvious however when you look at the difference in weight. Feriche et. all. (2011) give 41,7 grams for the heaviest male, and 70 grams for the heaviest female (not pregnant). Looking at (graph 2) it looks like my snakes have not reached their maximum length yet. My biggest female is now 51,2 cm at an estimated age of 6,5 years, weighing 65 grams. My biggest male is now 47,3 cm long, weighing 30 grams. According to Rossman, Ford and Siegel maximum length is 56,7 cm TL. The biggest female and male in the large sample of Feriche et all. (2011) were resp. 43,9 cm svl (app. 52,5 cm TL) and 36,9 cm svl. (appr. 44,7 cm TL). The smallest gravid female I have seen had a total length of 37,7 cm (personal observations). But Feriche et all (2011) shows very interesting data on a large sample of T. scaliger and they found a pregnant female with 26,7 cm svl. Based on a relative tail length of 16 – 17 % her total length must have been appr. 32 cm. One of my Captive bred females, nr. 10, had reached this length at an age of 10 months. So possibly females could become adult in their first or second year. None of my 3 captive bred females became pregnant when they were 2 years old, but they all gave birth around their 3rd birthday. The smallest male I have seen sexually active was 41,7 cm total length, but very likely they become sexually active at a smaller size. This is confirmed in Feriche et all. (2011): they estimate males to be adult at 23,5 cm svl., so a total length of appr. 28 – 29 cm. 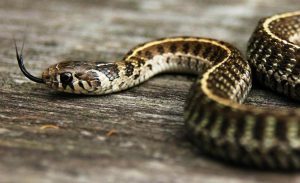 Keeping and breeding this fascinating little species of garter snake has revealed interesting information about their biology and ecology. 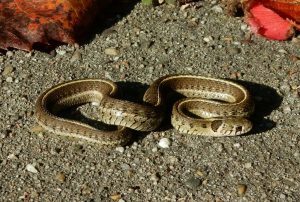 Unlike northern species of Thamnophis females of T. scaliger already show obvious signs of pregnancy as early as December but somehow manage to postpone parturition until May – June without going into a “true hibernation”. I describe the activity of the snakes in captivity throughout the year and I try to make some extrapolations to the behavior in the wild. In captivity they hold on to their period of high activity and intensive feeding starting in June – July. Some data on litter size and number of babies are provided. T. scaliger can grow very rapidly and could potentially mature at the age of 1 year old. Due to its small size this species can be kept in a relatively small set up and they do very well in captivity. Also raising the babies to adulthood was fairly uncomplicated. A unique way of simulating natural conditions during the winter season is described. 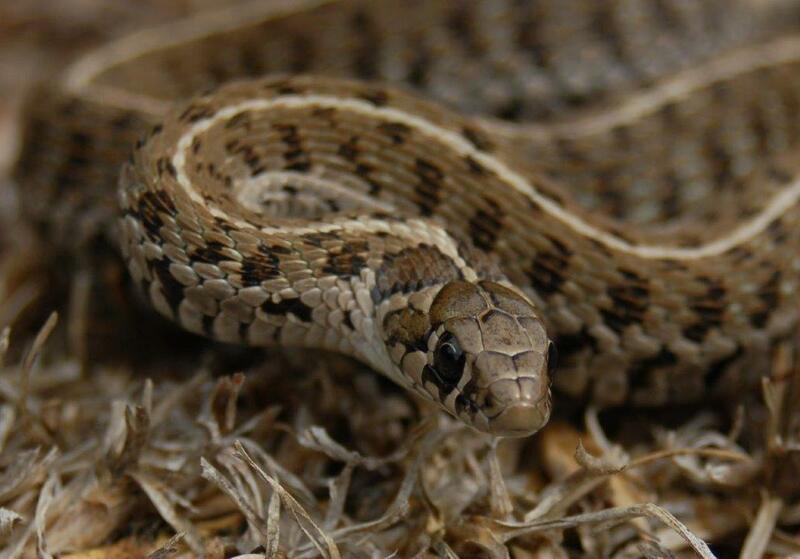 When one does not mind its sometimes secretive nature T. scaliger is very recommendable for garter snake enthusiasts who like to keep garter snakes in relatively small and natural set ups and who are interested in studying the biology of rare montane species of Mexican garter snakes. Feriche, M., S. Reguera, X.Santos, E. Mocino-Deloya, K. Setser &J. M. Pleguezuelos, 2011. Biometry and pholidosis of Thamnophis scaliger: an atypical example of sexual dimorphism in a natricine snake. Basic and Applied Herpetology 25 (2011): 105-113. Reguera, S., M. Feriche, X.Santos, E. Mocino-Deloya, K. Setser &J. M. Pleguezuelos, 2011. 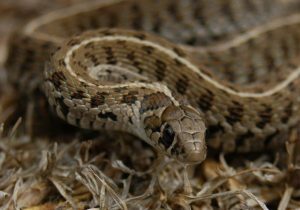 Diet and energetic constraints of an earthworm specialist, the Mesa Central Blotched Garter Snake (Thamnophis scaliger): Canadian Journal of Zoology 89: 1178-1187. Rossmann, D.A. and G. Lara-Gongora (1991). Taxonomic status of the Mexican garter snake Thamnophis scaliger (Jan). Abstr. Ann. Meeting Herpet. League, Soc. Study Amphib. Reptiles, State College, Pennsylvania.